Photo: Hospital officials unload the dead body of a plane crash victim outside the Teaching Hospital in Kathmandu, Nepal, Sunday, April 14, 2019. Kathmandu, Apr 14 : A small passenger plane crashed into a parked helicopter during takeoff at the only airport in Nepal’s Everest region on Sunday, killing at least three people and injuring four others, officials said. The crash occurred while the plane, a Twin Otter belonging to Summit Air, was trying to take off from Lukla for Kathmandu on Sunday morning, said aviation official Raj Kumar Chhetri. He said the plane skidded off the runaway, hitting the helicopter of Manang Air. Both are private airline companies that cater to tourists and Nepalese in the country’s remote areas. The injured were airlifted to Kathmandu by helicopter, Nepal police spokesman Uttam Raj Subedi said. The dead included a pilot of the plane and two police officers who were near the parked helicopter. A civil administrator, Narendra Kumar Rana, said the four passengers and a flight attendant on the plane were safe. Following the crash, authorities suspended services at Tenzing Hillary Airport at Lukla, the gateway to Mount Everest. The airport is often referred to as the world’s most dangerous because of the short runway and difficult approach. It’s open only to helicopters and small fixed-wing aircraft. It sits at an elevation of 9,334 feet (2,845 meters). In May 2017, a cargo flight was landing in Lukla when it lost altitude and crashed into a mountain below the runway, killing both pilots. Poor visibility was blamed for the accident. 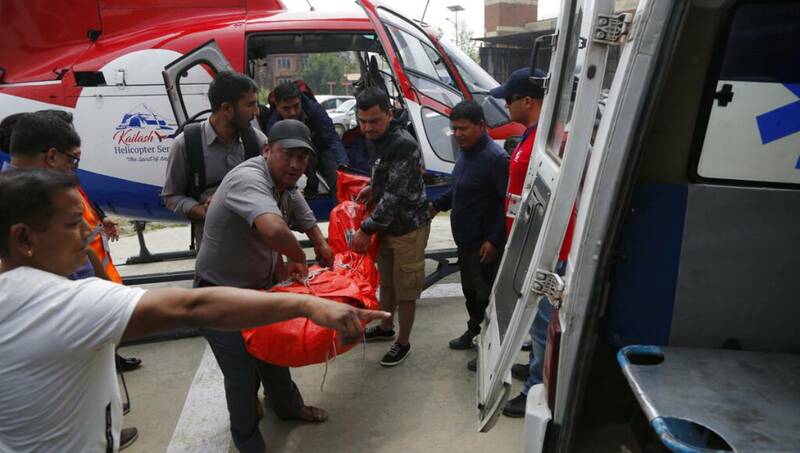 In February, a helicopter flying in bad weather crashed into a mountain in northeastern Nepal, killing all seven people on board, including the country’s tourism minister.